Add spaghetti squash parmesan to the new favorites list! If I’m being honest, I kind of feel like I’m living in 2009 with this spaghetti squash recipe. We used to love spaghetti squash and ate it quite a bit back then. Then we took a spaghetti squash hiatus, unintentional of course, and I basically… forgot about it. I showed much more love to other squash (hello butternut, forever) and, well, there is only so much one can handle when cutting huge squash by hand. You get me! But I’m back. Spaghetti squash parmesan that gives us permission to eat all the cheese. Last week, I asked on Instagram whether you’d like to see the guacamole turkey burgers or this spaghetti squash parm on Friday. It was CLOSE. I mean, it ended up being closer to 60/40, but I was still shocked at just how close that was! I was going to wait on this for another week or so, but after that, I had to share today. It makes for an amazing meatless Monday meal too. Just delish. Yesterday, I started my side dish Sundays series and while this could probably pass as a side dish for some (read: Eddie! ), it’s totally a main dish for me. It’s hearty and satisfying and really just tastes like the best comfort food. My go-to for this is marinara because it’s pretty simple. However! If you have any bolognese (like the bolognese from The Pretty Dish!) on hand – any version of your favorite meat sauce – you can use that too. That’s my number one secret for taking this from a side dish to a main meal for Eddie. If it’s stuffed with meat sauce, of COURSE he will eat it! This is also a dish that you can prep halfway at the start of the week. I actually did this yesterday. I roasted the spaghetti squash cut-side down on the baking sheet and stopped there. Let them cool, wrapped them in foil and stuck them in the fridge. Amazing, right? It’s like dinner is practically prepared already. All I have to do later this week is add a little sauce, cheese, seasonings and bake it. If this is more side-dish speed to you, if it seems waaaay more like something you’d love to have on the side of something, that totally works too. First, I love to eat it with a big salad. Especially the How Sweet Eats house salad! After that, I’d go with this bruschetta chicken. You could even sliced it and throw it on top. And of course, meatballs always work too. I make these bite-sized meatballs all the time. This is the comfort food dream! Spaghetti squash parmesan is a delicious weeknight meal! Topped with marinara or bolognese, melty cheese and fresh herbs, it's easy and delicious! Preheat the oven to 425 degrees F. Line a baking sheet with foil and spray with nonstick spray. Slice the spaghetti squash in half lengthwise and scrape out the sides. Brush the cut sides with olive oil. Place the squash cut-side down on a baking sheet. Roast for 25 minutes. Remove the baking sheet and flip the squash over. Use a fork to scrape some of the squash up. Season the squash with salt and pepper. Sprinkle on some of the basil and oregano too. Fill each squash with about ½ cup of marinara or Bolognese (your preference!). Lay the slices of mozzarella on top. Sprinkle on a bit more basil, oregano and the pepper flakes. Return the baking sheet to the oven and bake the squash for another 15 to 20 minutes, until the cheese is golden and bubbly. 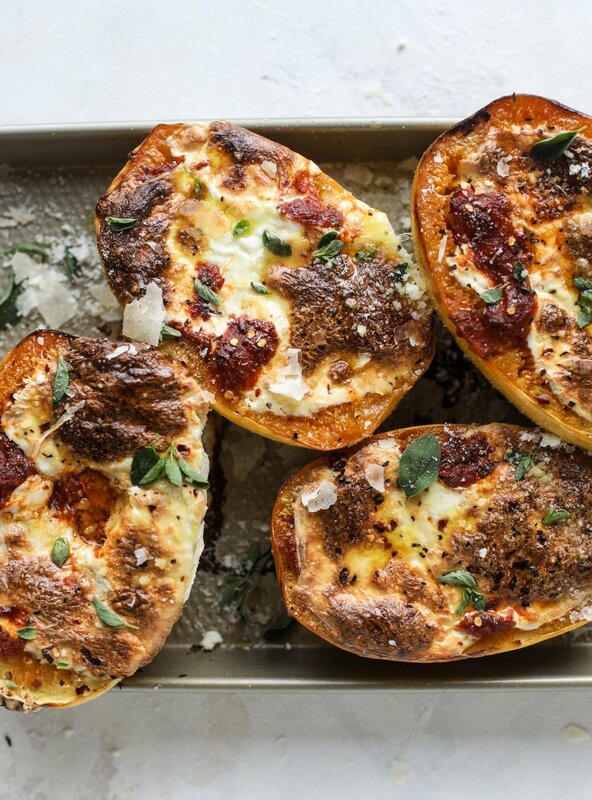 Sprinkle the squash with finely grated parmesan and fresh herbs and serve! I live for a good fork twirl. Soooo, I just now realized that I took an unintentional 2-year (!!!) spaghetti squash hiatus… bookmarking this recipe so I can end the break! right?! why do we do that?! haha! Did you mean 2009? You wrote 2019. Or do you have a time machine? Please tell me that a certain orange hued person is not in office anymore? Heehee! This looks delish and I just bought a spaghetti squash yesterday! Woot! This is not the place for your political thoughts. Um, why did you delete my comment? Omg I’m so sorry. My dumb phone. this looks awesome and filling and with it being negative degrees outside today, totally warming and comforting! I haven’t bought or cooked spaghetti squash in years but maybe I’ll have to now. thank you for sharing! yes you gotta try! thanks caitlin! As a vegetarian I would be all for it if you actually did a meatless/meat-free Monday series! But hoping that many of the side dish Sundays will be veg heavy/friendly too. Looks great Jess! Why can’t I PIN your recipes to Pinterest any longer? I just found out how to do it. For those looking for a quick and easy way to cut squash (this works for everything!). Pierce your squash a few times and microwave for 5 minutes. It softens the skin without cooking the squash. yes this is a lifesaver!! thanks megan!! Getting ready to make this. I’ve cooked this and other types of squash before, and it’s been quite a while, so as I was reading directions, it took me a few moments to realized that in step 2 it meant to scrape out the insides rather than the sides. Really looking forward to this for dinner! Thanks!